During next four weeks I am presenting four totally different churches in my country. When saying different, I really mean it. 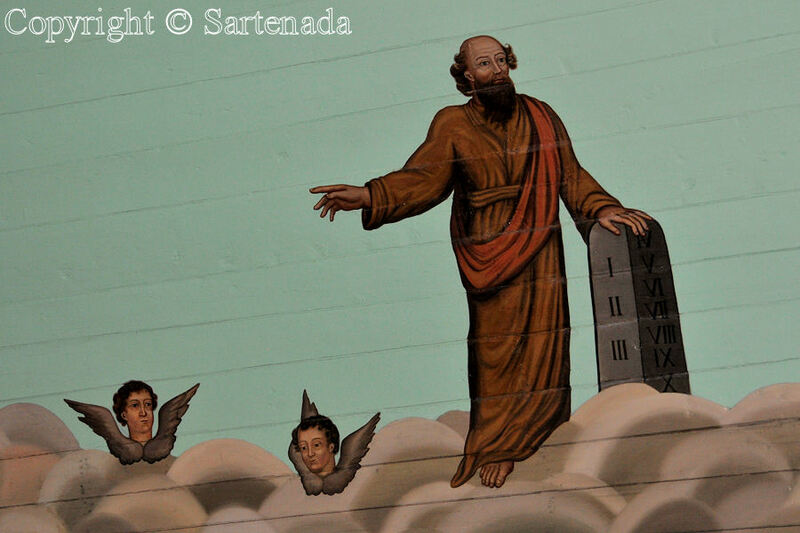 I start the presentation with “100 angels’ church” or “Picture church” as it is known also. 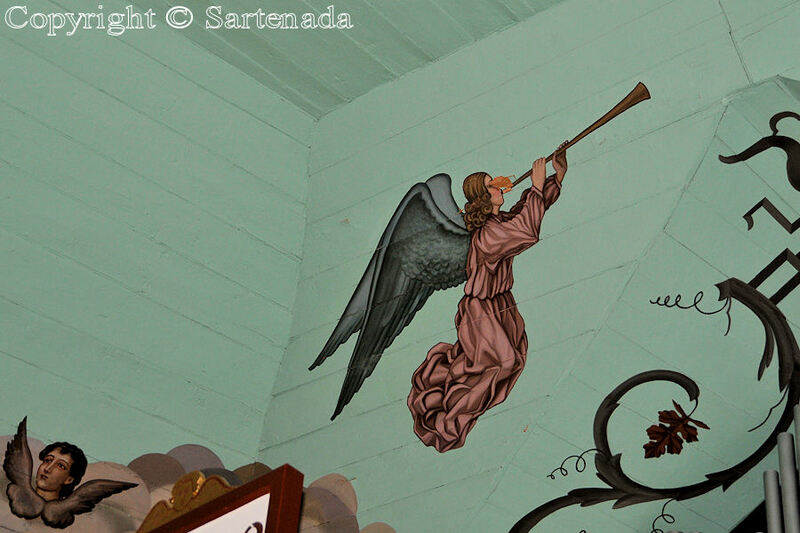 In this church there are painted more than 100 angels. 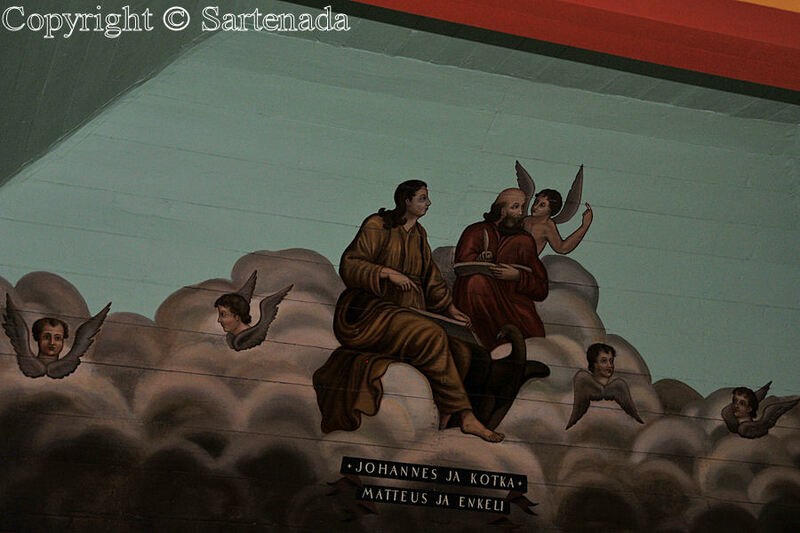 Also there is painted the Creator of the World, although the Bible says that it is forbidden to make a picture of God. 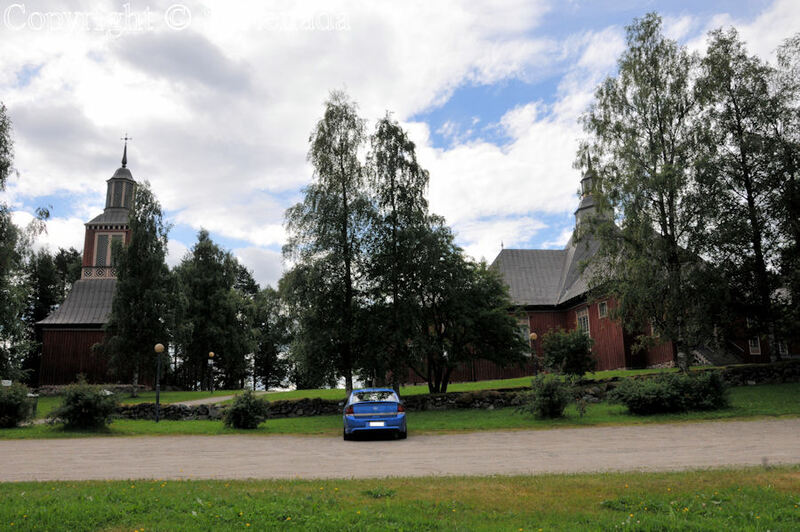 Ilomantsi is a municipality in North Karelia and it can be reached from Helsinki by car in 6 hours. Its situation is quite near the Russian border. 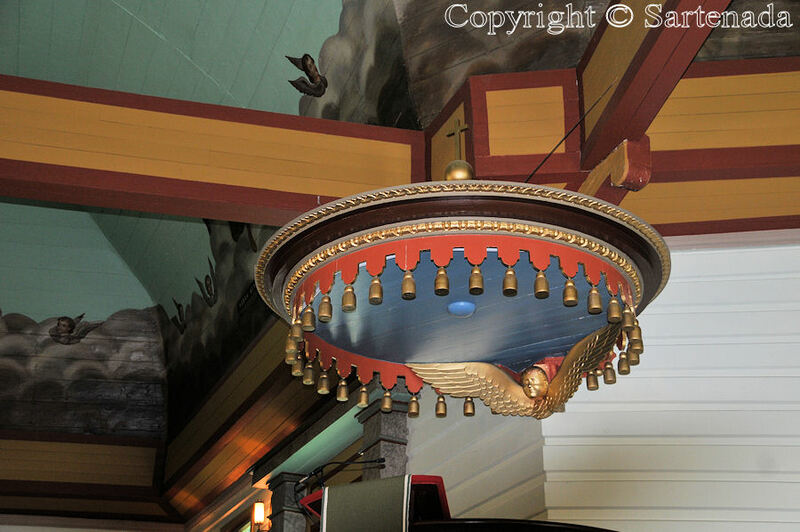 So the “Frontier spirit” is touchable there although it is Karelian style. 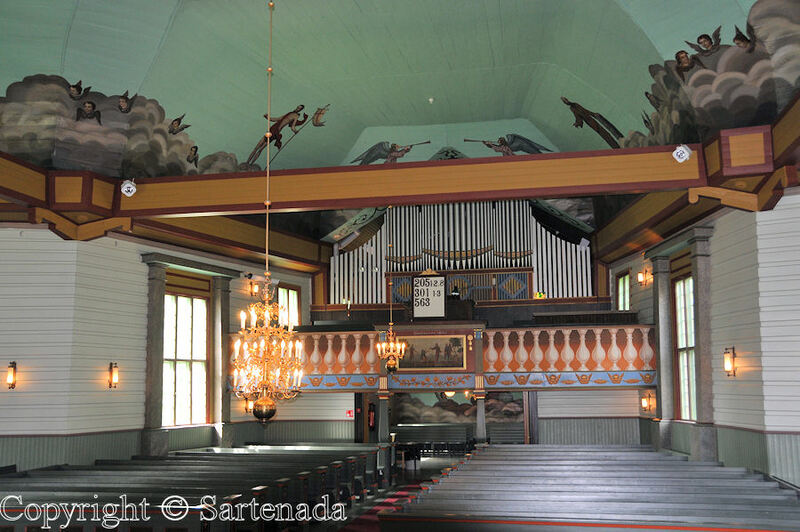 Pews of the church are for 800 persons and it was built in 1796 by Henrik Johan Mechelin. 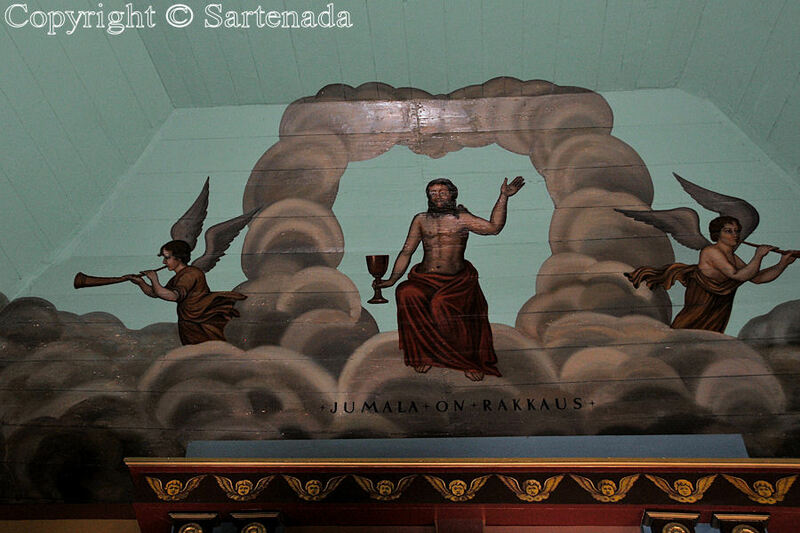 Also the altarpiece is by Henrik Johan Mechelin. 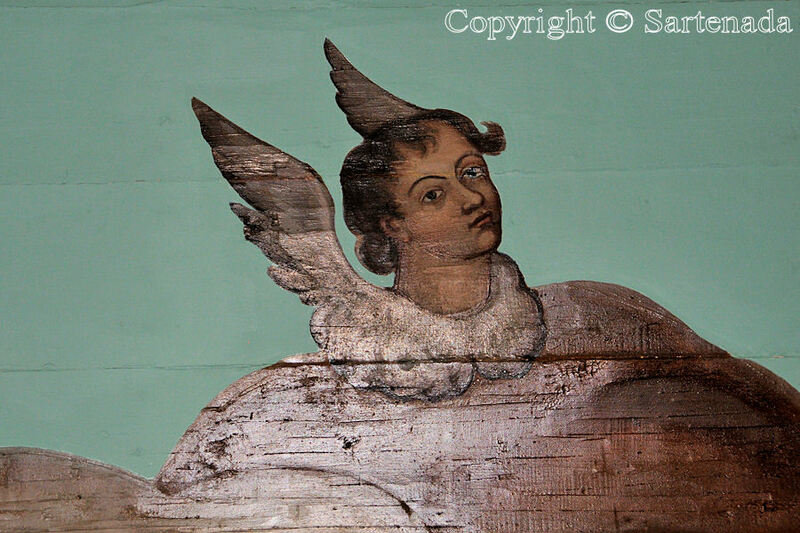 Samuel Elmgren (1830–1832) painted those angels and stories with person from Bible. 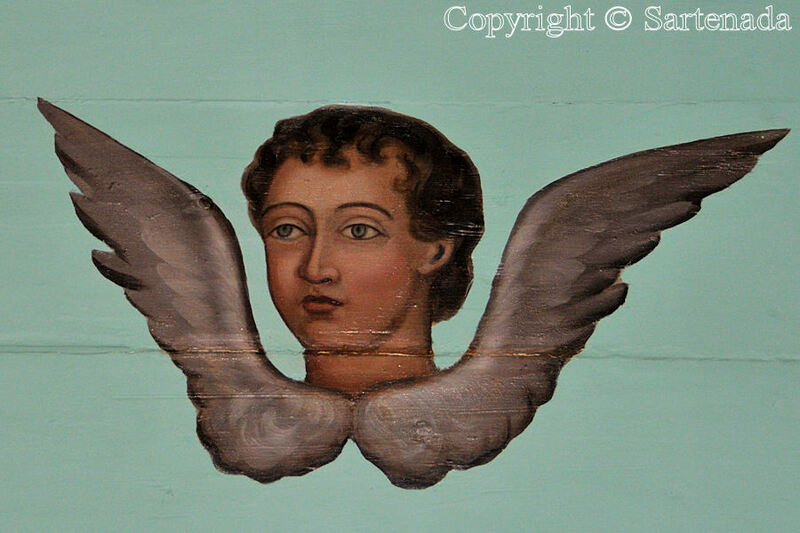 Enjoy viewing angels. Durante próximas cuatro semanas que estoy presentando cuatro diferentes iglesias en mi país. Al decir diferentes, lo digo en serio. Inicio la presentación con “Iglesia de 100 ángeles” o “Iglesia de imagen” como se lo conocen también. 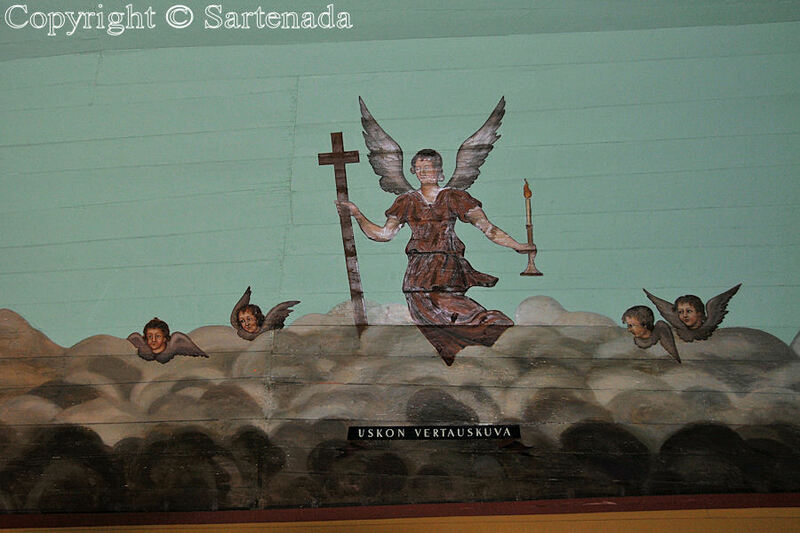 En esta iglesia hay pintadas más de 100 ángeles. Asimismo, el Creador del Mundo, aunque la Biblia dice que está prohibido para hacer una imagen de Dios. Ilomantsi es al noreste de Helsinki en coche unas 6 horas. Su situación es muy cerca de la frontera con Rusia. Así que “El espíritu de frontera” es palpable al estilo de Carelia. 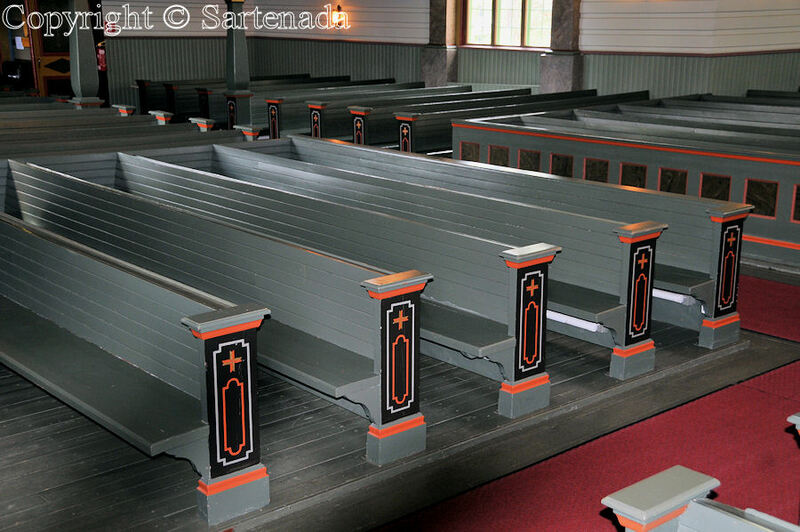 Bancos están para 800 personas y la iglesia fue construida en 1796 por Henrik Johan Mechelin. También el retablo es por Henrik Johan Mechelin. Samuel Elmgren (1830-1832) pintó los ángeles y otras personas e historias de la Biblia. Disfrute viendo ángeles de esta iglesia. Pendent suivant quatre semaines, je vais vous présenter quatre églises différentes dans mon pays. En disant différentes, Je veux le dire vraiment. 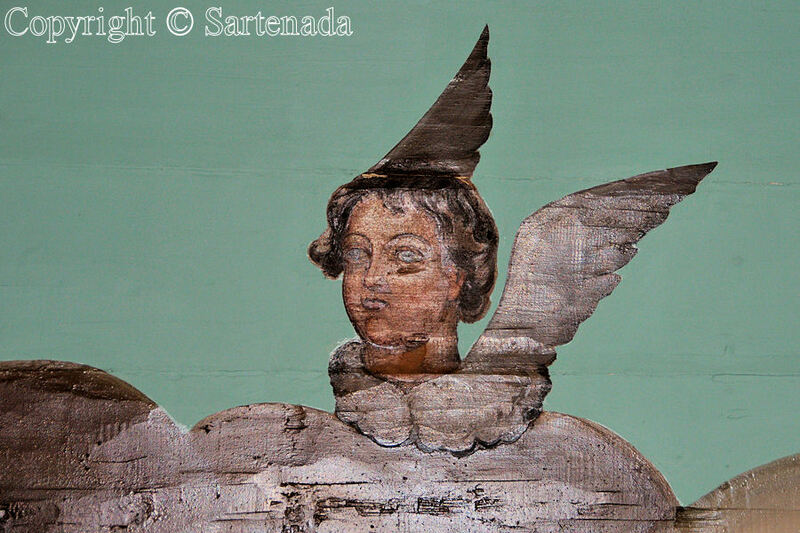 Je commence la présentation avec “Èglise des 100 anges” ou “L’èglise de l’image” comme elle est connue aussi. 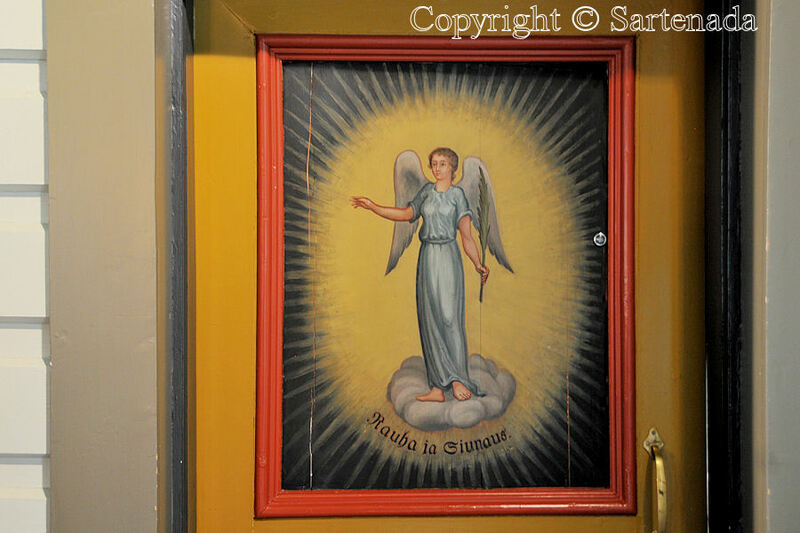 Dans cette église il ya peint plus de 100 anges. Aussi le créateur du monde, bien que la Bible dit qu’il est interdit de faire une image de Dieu. Ilomantsi est de Helsinki vers le Nord-est et le trajet dure en voiture d’environ 6 heures. Sa situation est très près de la frontière russe. Alors l’esprit de «frontière» est palpable bien que soit c’est le style de Carélie. Les bancs sont pour 800 personnes et elle a été construit en 1796 par Henrik Johan Mechelin. 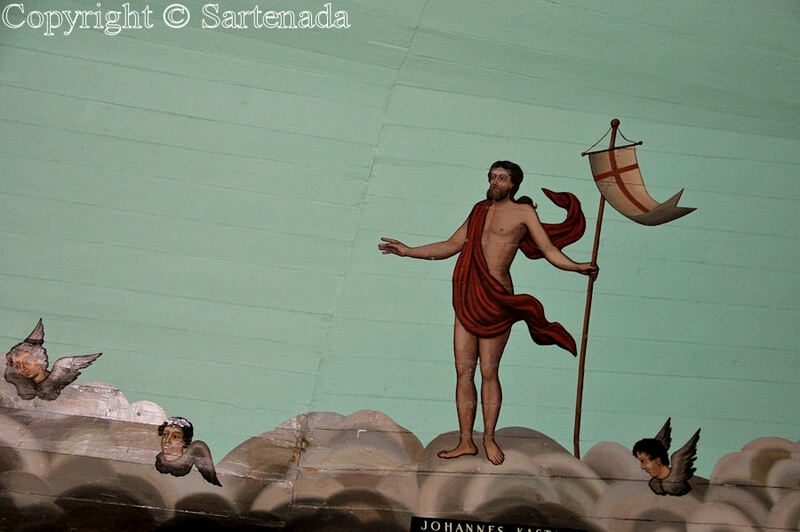 Aussi le retable est par Henrik Johan Mechelin. Samuel Elmgren (1830-1832) peint les anges et les autres personnes et les histoires de la Bible. 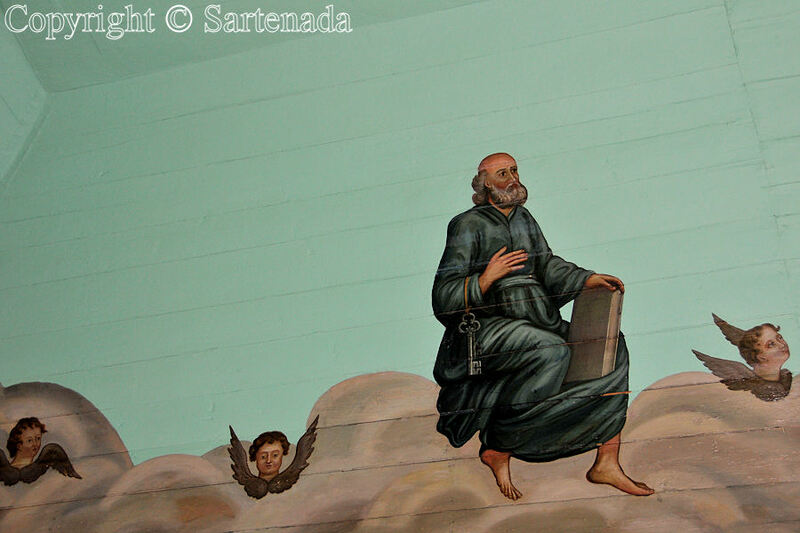 Jouissez-Vous voyent les anges de cette èglise. My what a beautiful church that is! It would be very interesting to me to attend a service there. I would love to see it when filled with worshippers. The architecture of your country is very pleasing to see and the insides of the church are very beautiful too! Thank You. Because this church is situated “far away” from my house, I have not been visited in it earlier until this year. This summer I was lucky to go inside. I had read that there are a lot of paintings and thus I was very interested to see them. 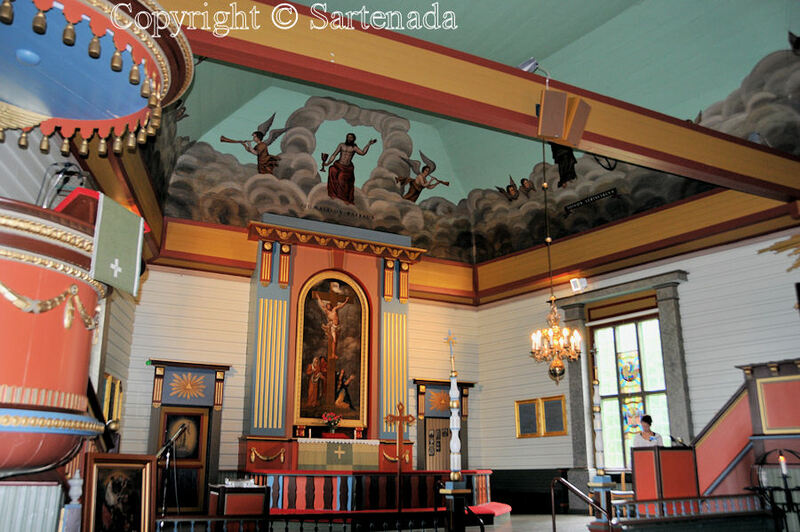 What a fine presentation of this beautiful church, it is so different from our churches here in Denmark, I like the wood as building material, and together with the colorful painting and all the angels in the church it must make you feel pleasant, uplifted and welcome here. Thank You. I like wood also very much to be used as building material. It makes churches different from those stone churches. Anyway every church has some specialties. Danke schön. I am glad that You liked these paintings and I wished that that You could see them. 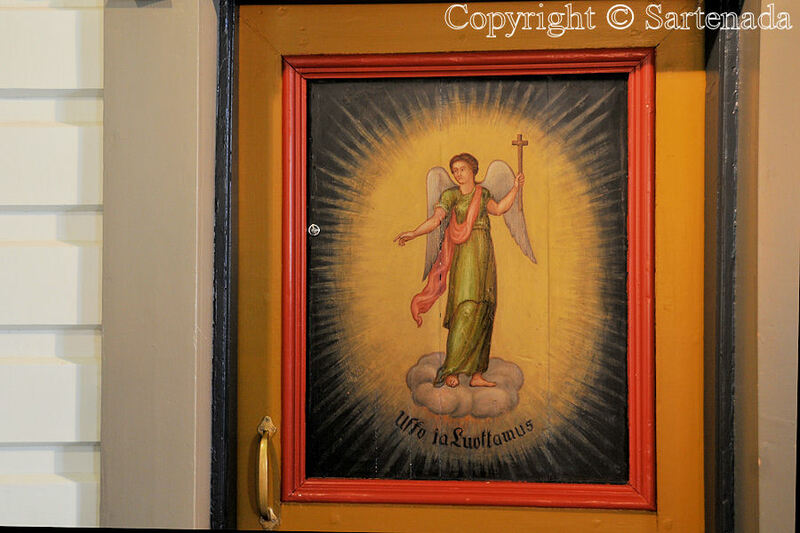 Although in some of our churches there are paintings, but I love these due to their “fresh” colors. I like how the colors are so similar to many of the buildings and houses are you have shown in past posts. Very different from the churches I have been in the States. We don’t have the bright colors. I am so glad that You liked this post of mine. It is always so nice to read pleasant comments about my posts which have required plenty of efforts, driving around in my country and time also. But I enjoy to explore my country and to find something new to me. Thank You so much for Your comment. 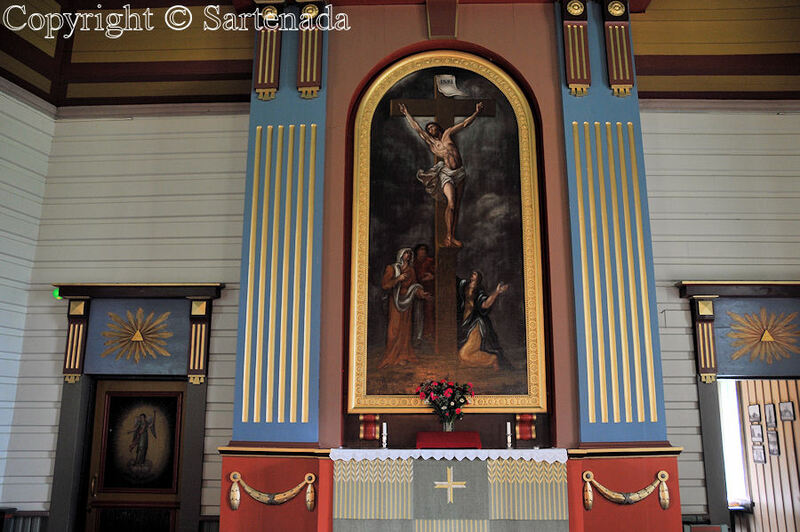 I have never seen myself a church with this kind of color inside, but everything seems to be possible, I think. Je te souhaite un très agréable weekend! 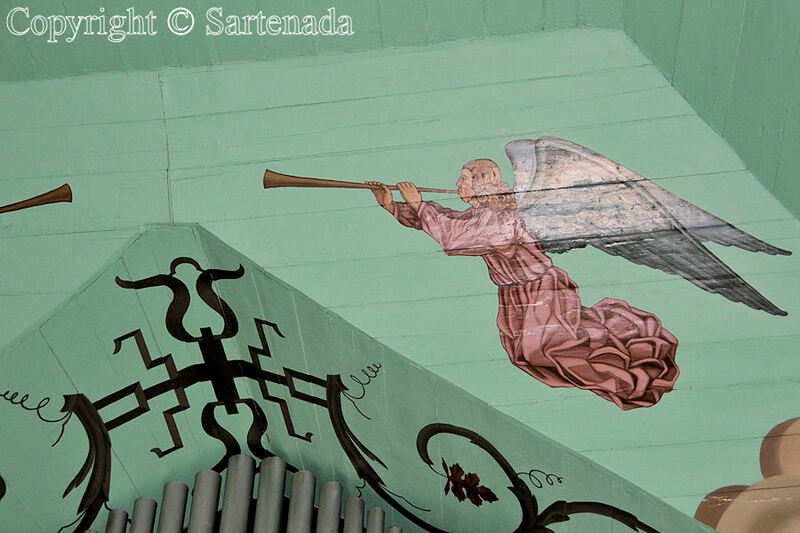 Espectacular la decoración con 100 ángeles de las paredes de la iglesia. Muchas gracias por tu visita y al hacer un cometario tan amable. Espero con todo mi corazón que tengas un muy buen domingo. 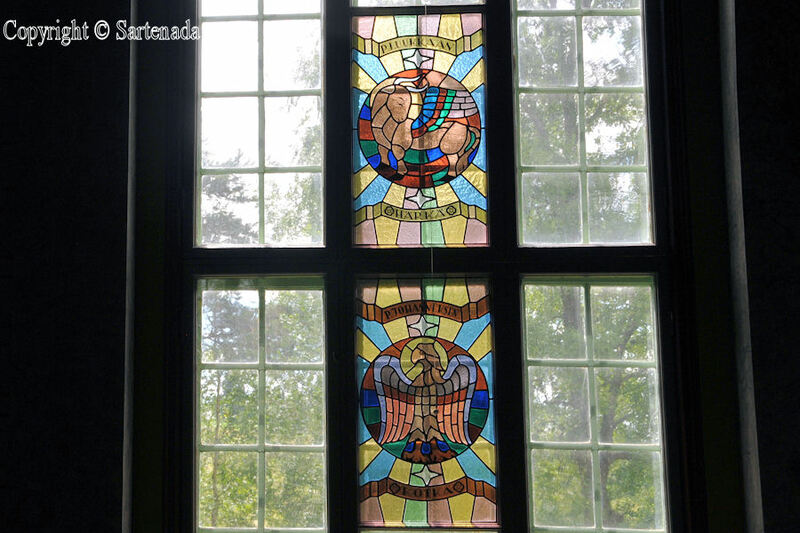 What I really like is the details in the artwork, colors, and stained glass. 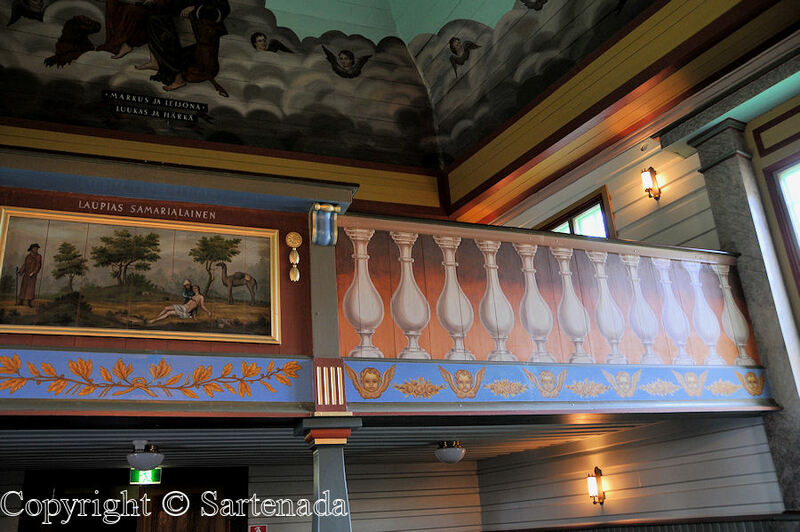 The photo, Laupias Samarialainen, the painting is quite unusual for me as I haven’t seen anything like it. Also, I have seen some beautifully decorated churches in the U.S.A., but nothing like this “Picture Church” with its wonderful bell tower. Thank You Anna for Your nice comment. 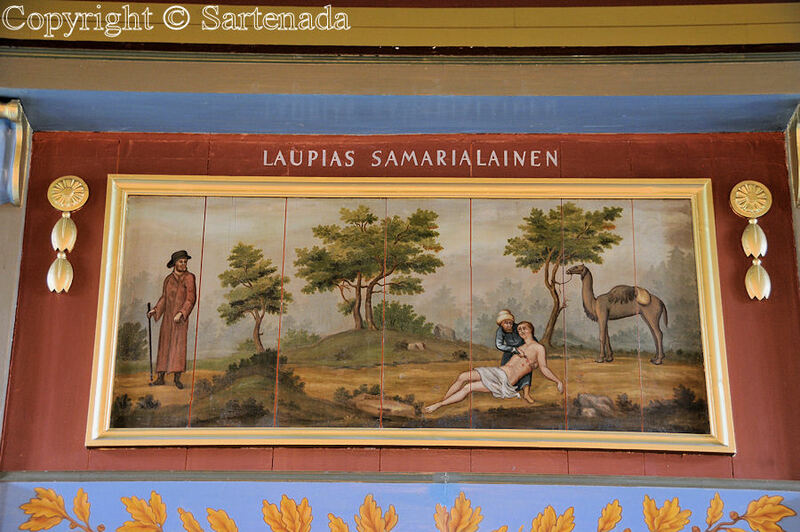 I guess that You solved in Your mind what is “Laupias Samarialainen”. Yes, it is Good Samaritan. Wow! 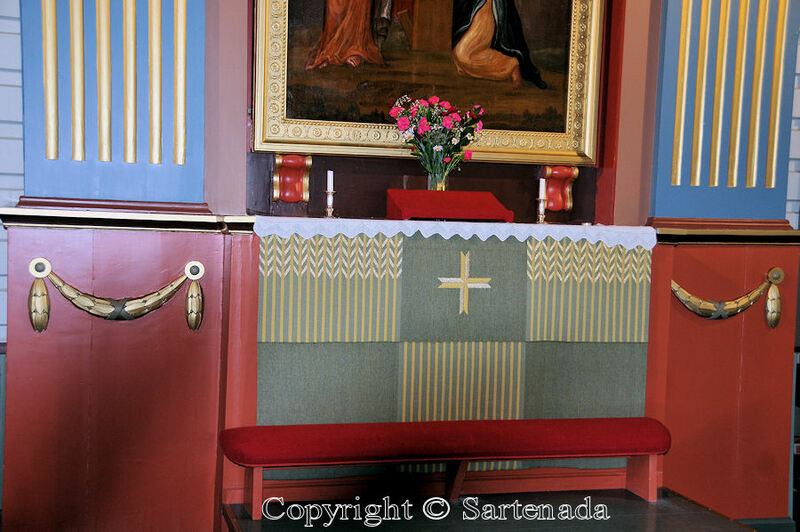 Finnish church is so unique! Some English churches are very similar to yours. Nothing very fanciful. Just a place for worship. 6 hours of drive? That’s quite a long journey but it’s definitely worth it. Thank You for Your visit here and leaving Your comment. Yes, six hours, that’s right, but not driving on highways, but local twisting roads. 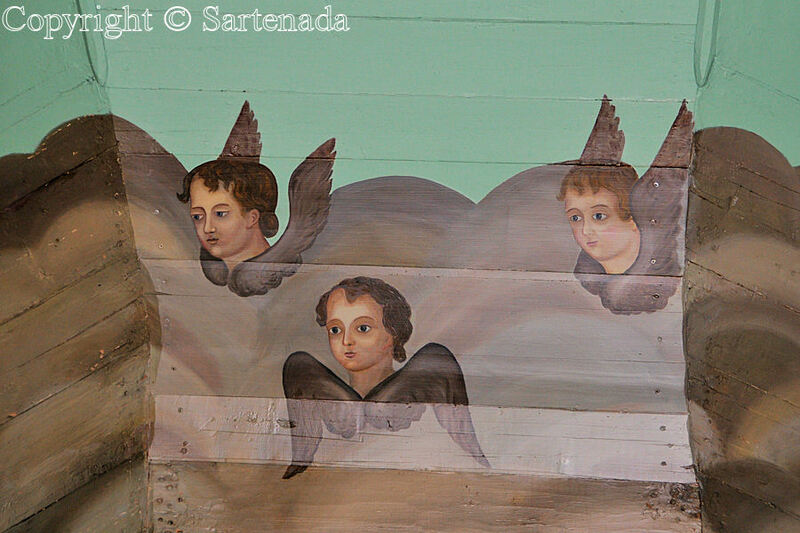 At same time I was photographing a very special exhibition of wooden art made by local artists. That I’ll publish next year and I can say in advance that those wooden figures are curious and at same time hilarious. C’était très agréable à lire que tu connais la Carélie. Il ya “deux Carélies”, l’une sur le côté finlandais et l’autre sur la partie russe. Autrefois les gens ont été de même origine, je croix vraiment. Un excellent exemple est notre l’épopée nationale Finlandaise – Kalevala. Je suis tellement contente que mon post t’as plu. Je te souhaite aussi un très bon dimanche. Ce sont de très belles couleurs dans vos églises. Merci beaucoup pour ton visit et de faire un commentaire si gentil. Belle journèe á toi aussi. I really like the outside of the church and the varying roof heights. 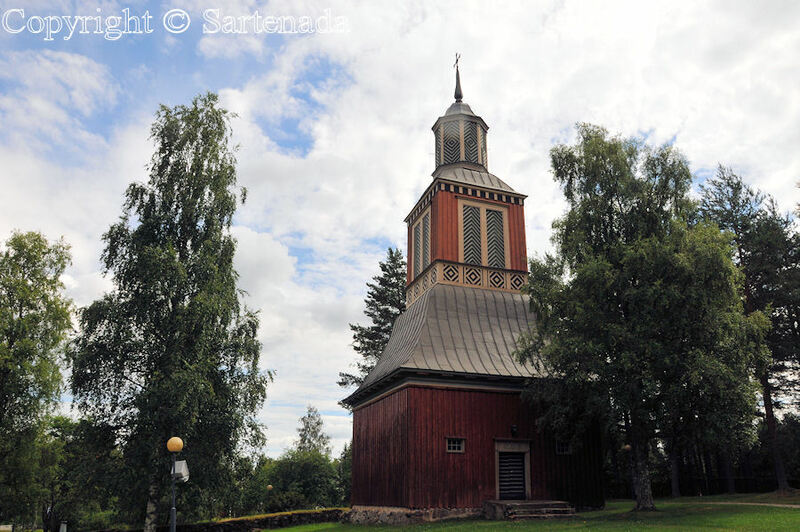 The shapes are simple, but there is decoration on the bell tower and the wood and colour make it an impressive building. These old buildings are very special. Thank you for your series of photos and for taking us inside to see all the paintings. The church seems to be so called “Cross church” and with it I mean its form. The contrast to it is a rectangular church. Rectangular form is the most basic, easy to build and most cheap of course. Some churches in this form are looking like “cow house” when seen from outside. Inside look is then another thing and then one can have surprises. Maybe someday next year I’ll present a church in rectangular form, but a beautiful one. 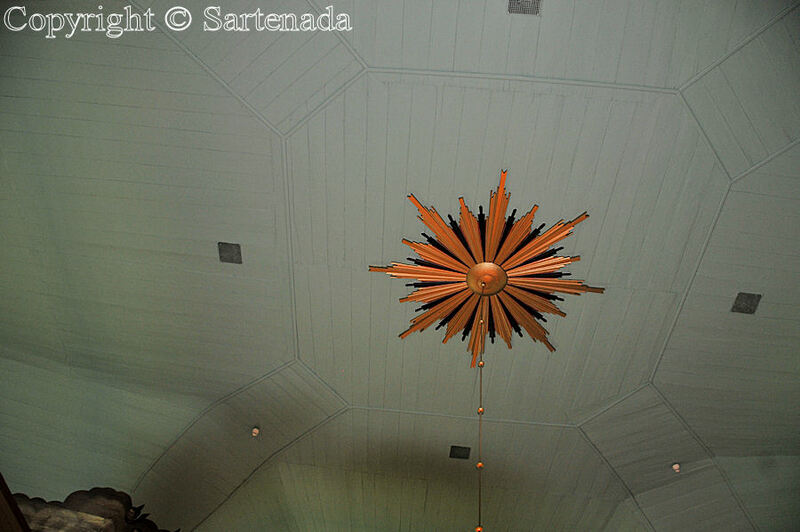 This church roof is really special here in Finland, as I have noticed on my many trips. It is not so common that the roof is cut from each side at the top. 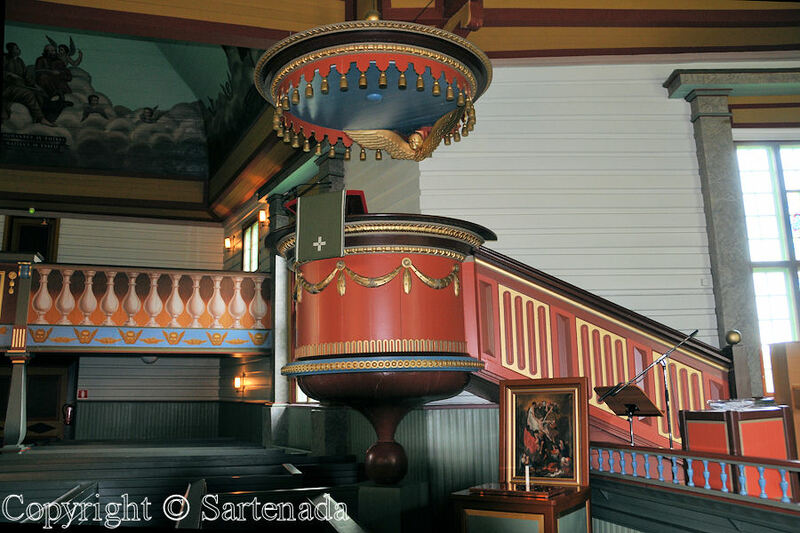 I’ve noticed, as in your third photo, your churches have this round – cylinder stage like area… What is this? 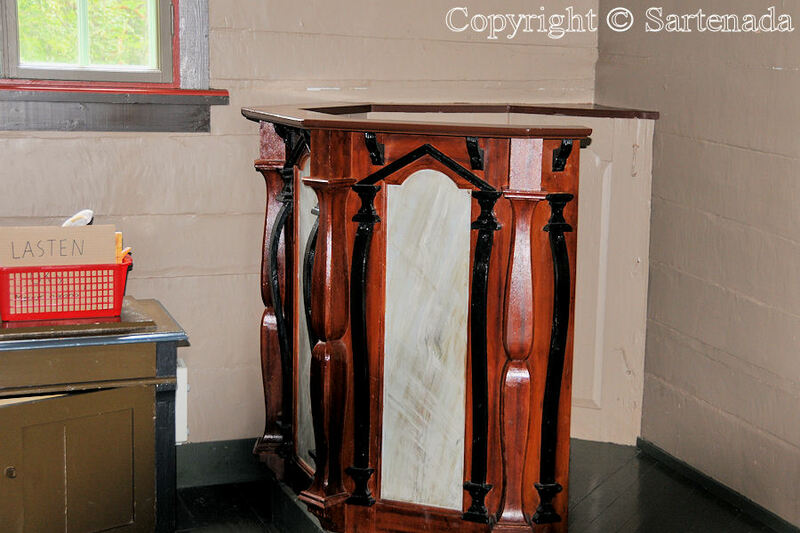 Is it the pulpit where the preacher gives the sermon? Merci beaucoup de ton visit et ta remarque Frammy. 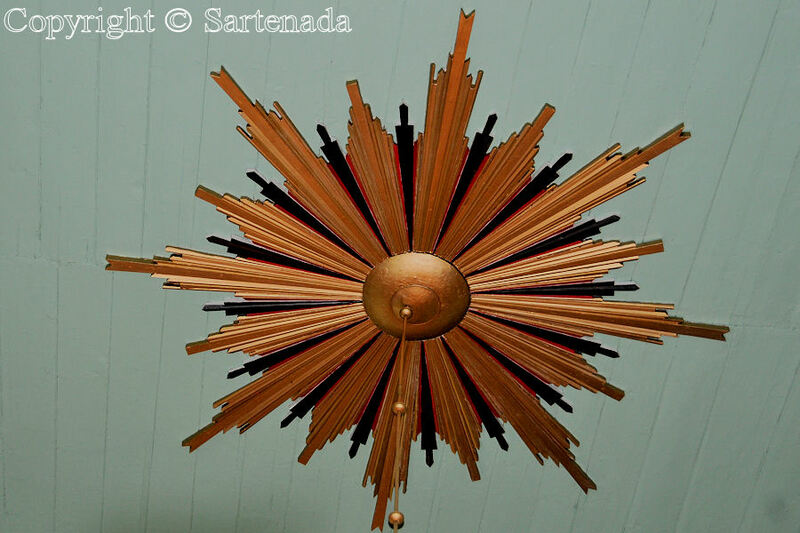 Wow, Stained glass, painted decoration, beautiful timbers, angels, architecture … and detail, detail detail, what’s not to LOVE about your blog?! I’ve subscribed 🙂 I’m very much looking forward to seeing more of your photos, wonderful!!!!! Thank You so much. I am glad my post pleased to You. Your blog is also full of wonders and I like it. Thanks sooo much for sharing these beautiful photos! I, too, love angels. A lot. 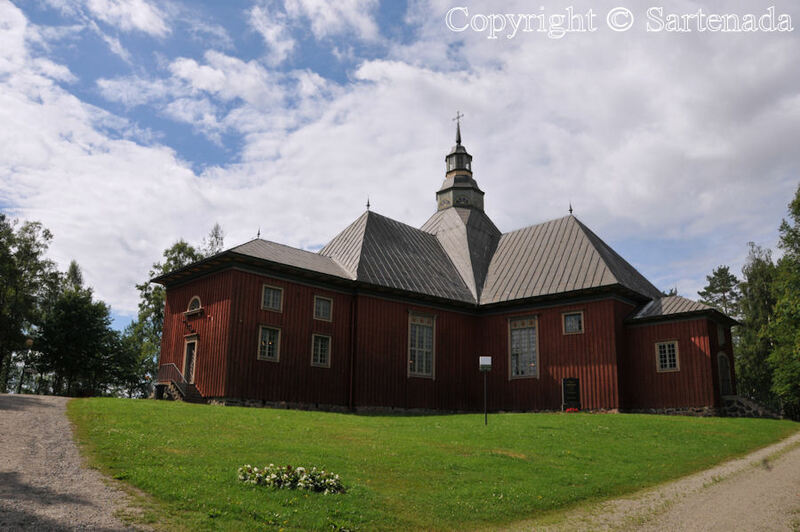 I am glad that You liked this wooden church in Finland. 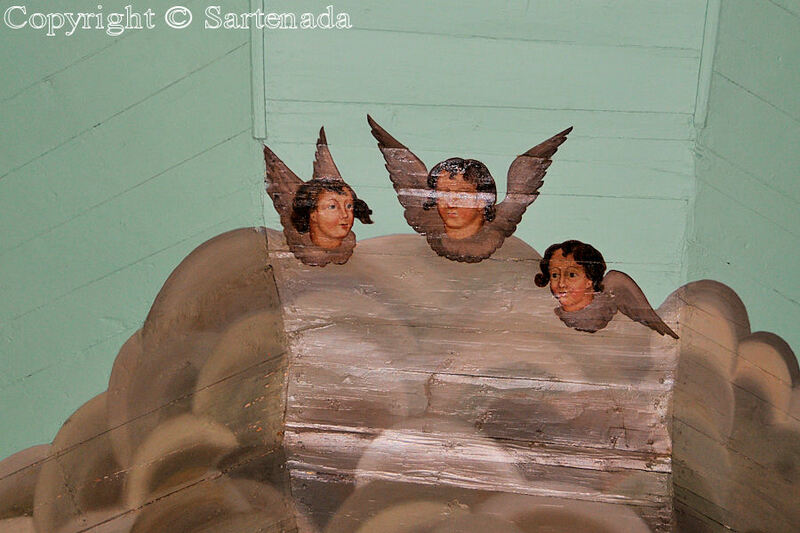 We have very special churches here which are wooden made. Personally I like them very much. If You visit them, you will be surprised, I am sure about it. This is an amazing church. I love the painting and the subtle colours. How I would love to see this in person! Thank You for Your visit and lovely comment. 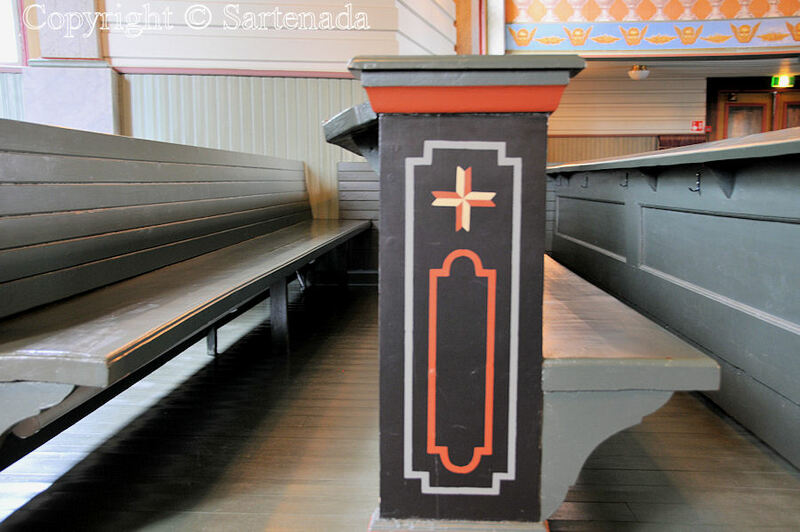 This is only one example of our wooden churches, but it is a good one. 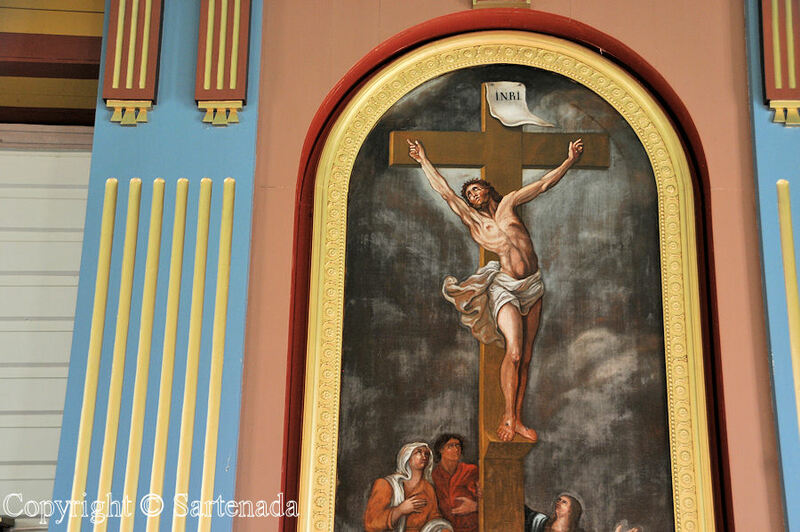 Gorgeous photos of a beautiful church. Thank You. 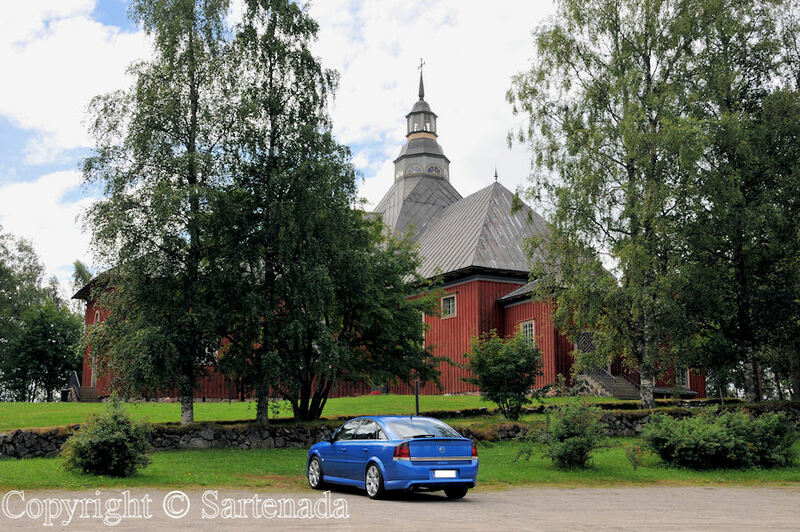 It was so nice to read that You liked this wooden church our countryside. 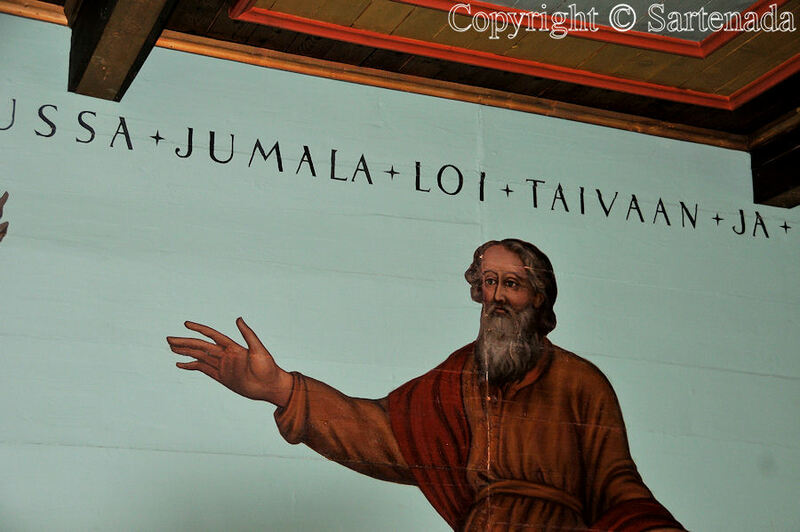 We’re at the world’s biggest wooden church today in Kerimaki. We’re visiting Finland right now. We celebrated Juhannus on Kaunissaari, we’ve been to Kokkola, Kuusamo, Savonlina. It’s so beautiful here. What a surprise!!! I am amazed that You visit my “unknown” country. The beginning of this summer has been rainy and cold, but sometimes sunny. 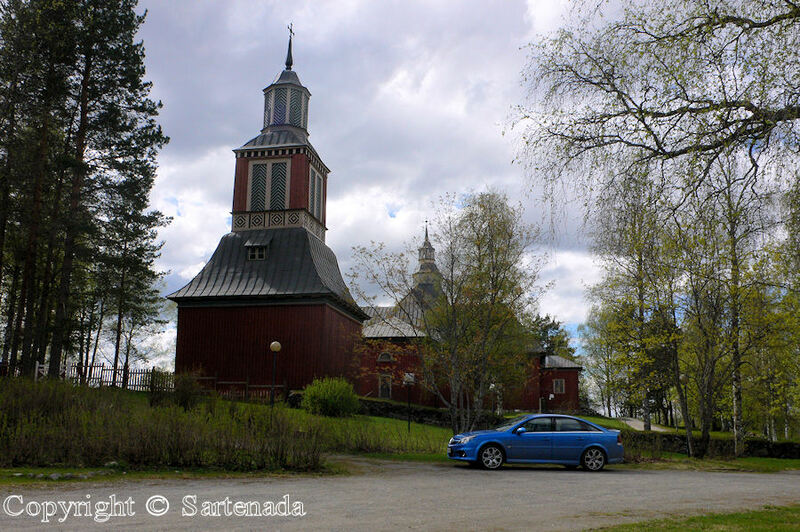 We just came from our countryside cottage which is near to the small town call Varkaus. Varkaus and Savonlinna are quite near to each others, the distance is only about 80 kilometers / 50 miles. I’ll write to You a mail. 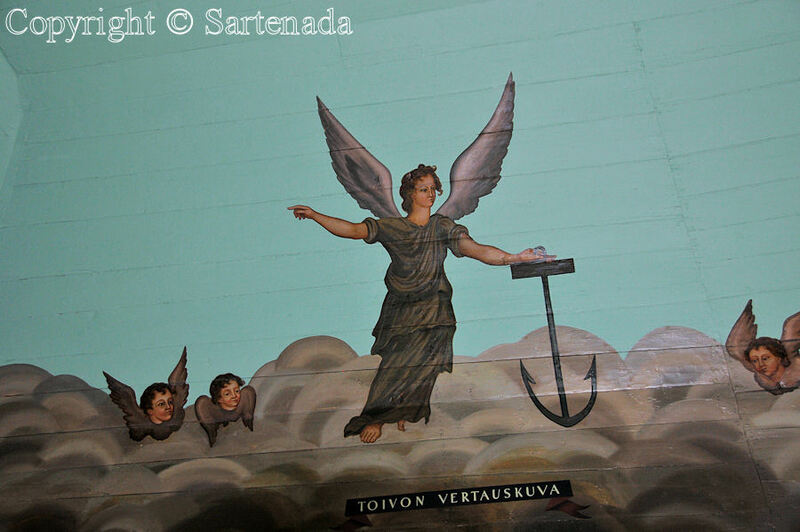 Happy stay in Finland and remember to make posts in Your blog. For over 40 years I only knew some of your country from my fascination with the Kantele. For me, the sound was unique and the old styles of music were very seductive. I read a few books and rarely saw TV programs. Now that we have been to Helsinki twice and have seen your remarkable photos, my admiration for Finland has grown enormously. 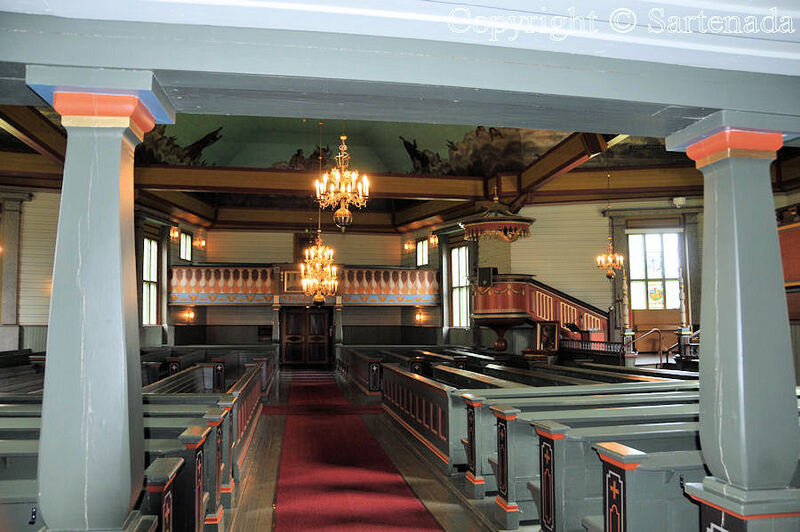 I felt awed by the Old Church in Helsinki. It is so clean, beautiful and inspiring. Lots of our English churches are dusty and gloomy (but not all). 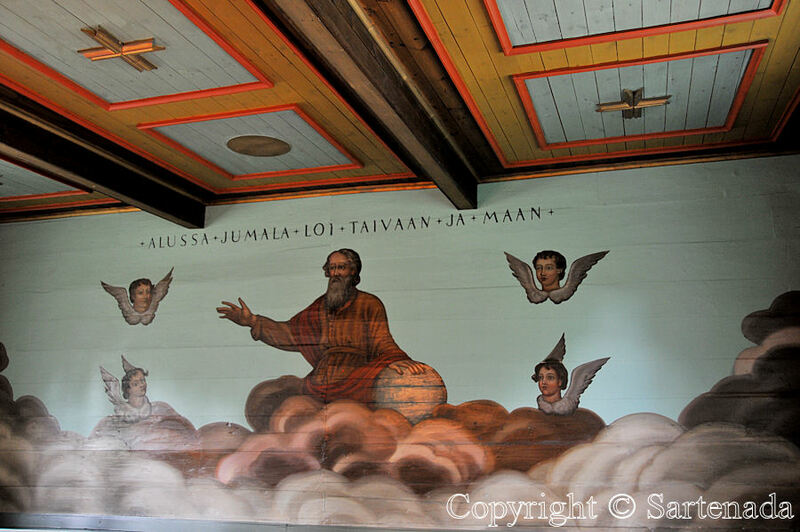 Your photos of Finnish churches have made my soul smile in wonder. One of the many CD’s I bought in Helsinki is “Kanteleeni”, Spiritual Melodies from Finland; played on Kantele. I can imagine some of them being sung in the Church of 100 Angels. Again, I am awed! I sent some of my photos of the Old Church to my friend in Scotland. He is a Scottish Church Elder. He said, “What a wonderful place of worship it must be” Yes, indeed! Thank you for this amazing set of pictures. Try http://www.rydebaptist.org This is my church. I checked the link which You gave here and I find Your community very active and warm hearted. I wish to You both a very happy and sunny summer. 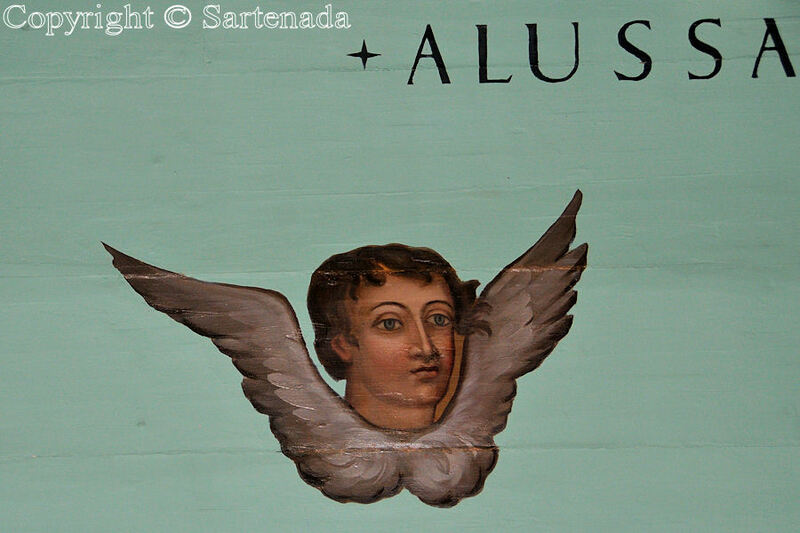 They are wonderful angels and the churches are breath taking, must have a holiday in you lovely country. Thank you for sharing the link on my blog. Thank You very much for Your praising comment. If You some day decide to come here, then let me plan to You best routes and maximum amount of travel sights. Thank You. 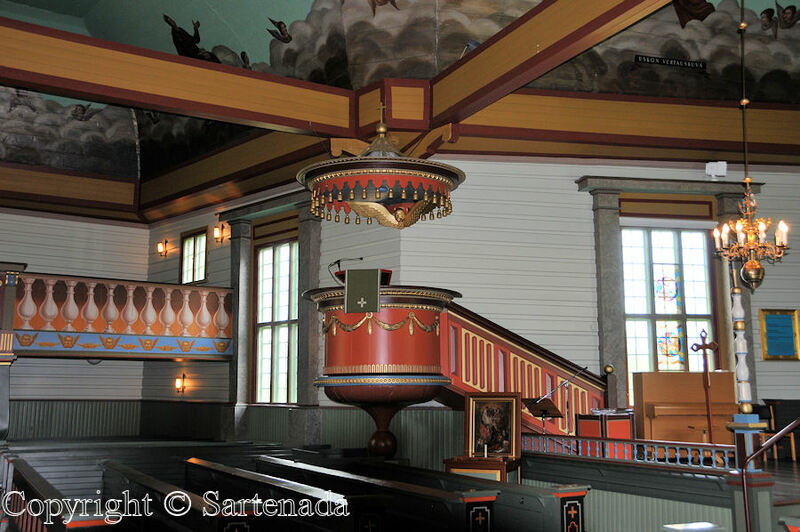 Churches offer huge amount items to be photographed, like chairs, altarpieces, chandeliers, pews etc. hello there – wonderful photos – I have been to Helsinki and also spent 2 weeks in February up in Pukaharui – all the shops were shut and we had to take skis to go to the nearest shopping opportunity a gas station, I got very tired of smoked fish and dried soups during that time I can tell you. but I did enjoy the landscapes the snow on snow on snow of the trees and wide expanses of frozen lake – oh and I went to a russian restaurant in Helsinki and had the most wonderful honey vodka so many good memories! I knew exactly about what You meant. There nothing to excuse!!! Particularly interesting those lively colors and the wood as building material. 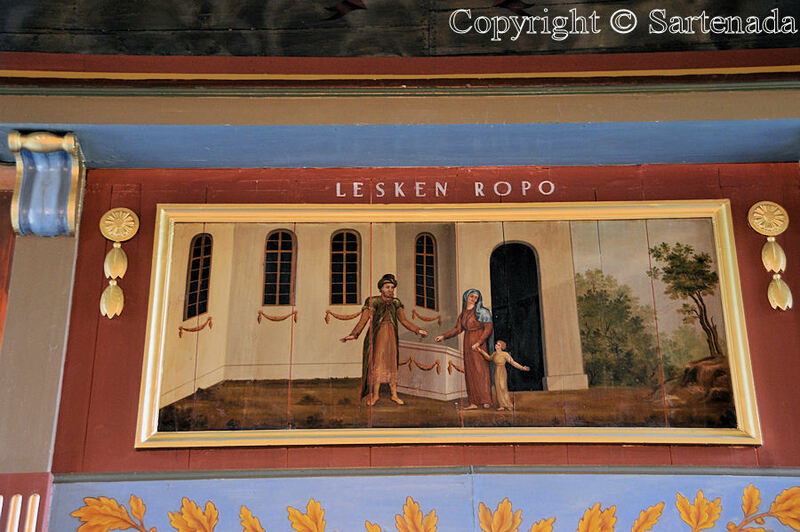 The paintings are beautiful and very inspiring…..what more can I say? Thank you for reproposing this post which I had missed years ago…. Very nice m. I appreciate it very much because in Your country there are so many wonderful churches. 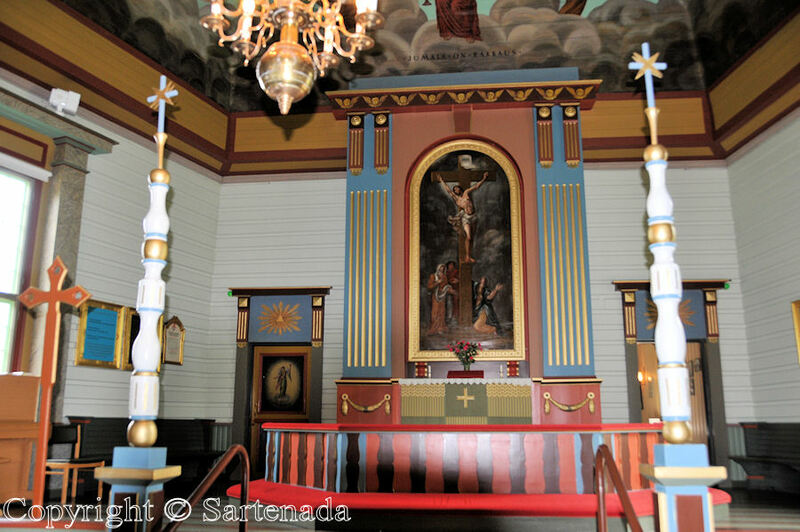 Of course, these wooden churches differ from those in Your country. 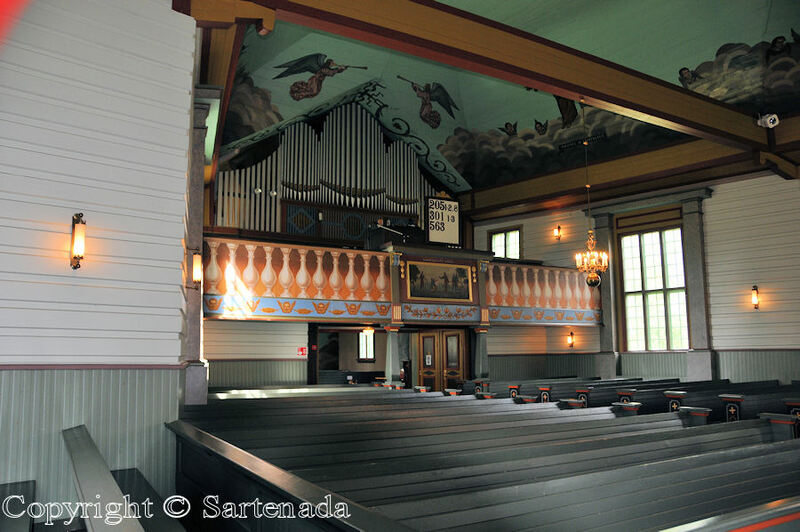 This church is situated in a small place nearly in the middle of “nowhere” in the same small town where there was held the Bear Carving Contest. I think it is wonderful what you are doing. While it is art and beauty on its own, it is also history – often churches decline and disappear without anyone to record the beauty in art and architecture that they hold. This is fantastic! 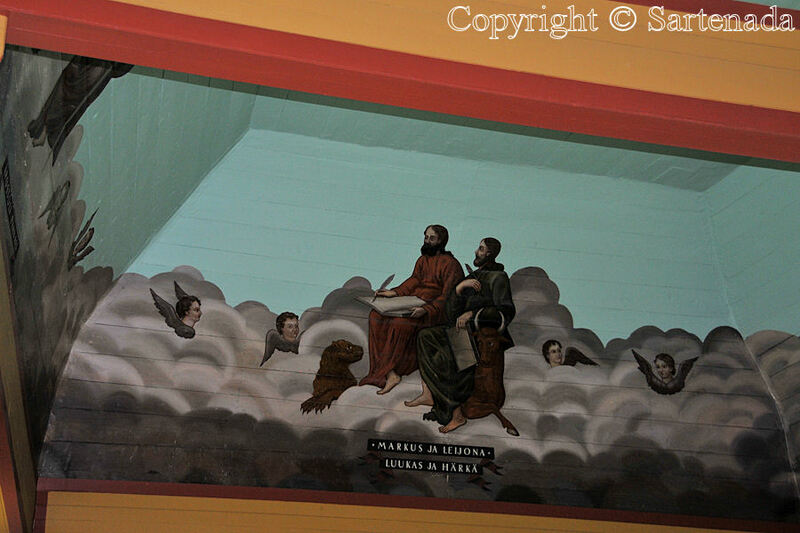 I often sit around American churches wondering, where is all the art? 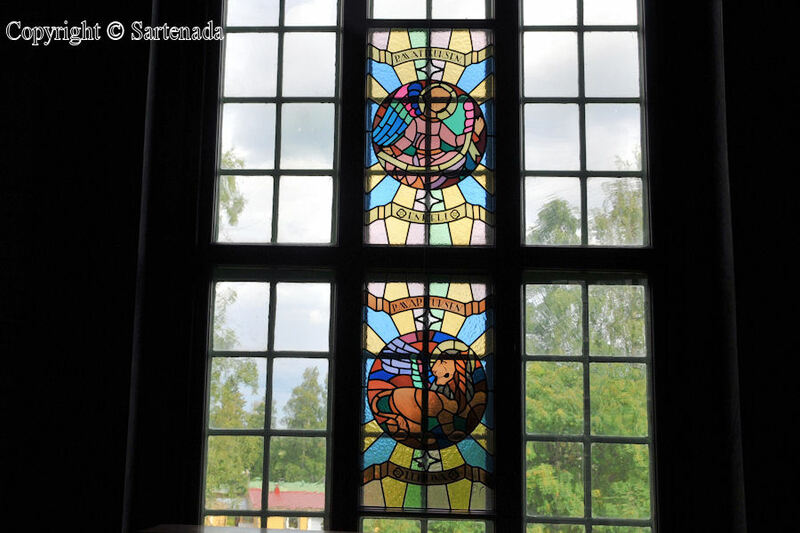 We rarely even have stained glass windows anymore, they all look like recreation halls! Worshiping God is not about the building, but if you’re going to go to all the trouble of building something for God’s glory, you might as well make it beautiful and symbolic. I love how rich in symbols the churches are that you share! Thank You Jared. Did You check the church of Haukipudas? It is inside gorgeous.